Julie Dietzel-Glair is a freelance writer and library consultant. 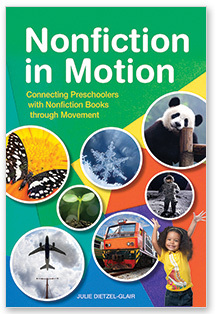 She is the author of Books in Motion: Connecting Preschoolers with Books through Art, Games, Movement, Music, Playacting, and Props and the co-author of Get Real with Storytime: 52 Weeks of Early Literacy Programming with Nonfiction and Poetry. She uses her years of experience as a children’s librarian and assistant children’s services coordinator to provide training sessions for librarians and other early literacy providers. She is active in the Association for Library Service to Children (ALSC). Storytime planners and presenters will save time with this useful collection development tool that utilizes quality nonfiction books to bridge the reading gap.